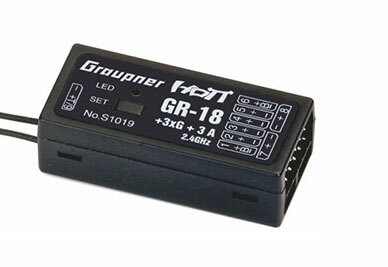 The Graupner GR-18AIR receiver sets a new standard for flight controllers. The GR-18 is an airplane stabilizer, flybarless helicopter controller all in one compact package that includes also real-time telemetry and a long-range receiver. Power and simplicity are the hallmarks of the Graupner GR-18AIR. Engineered with an integrated flight controller for flybarless helicopters and an airplane 3-axis stabilization gyro, this is one of the most advanced 2.4GHz receiver ever made by Graupner. 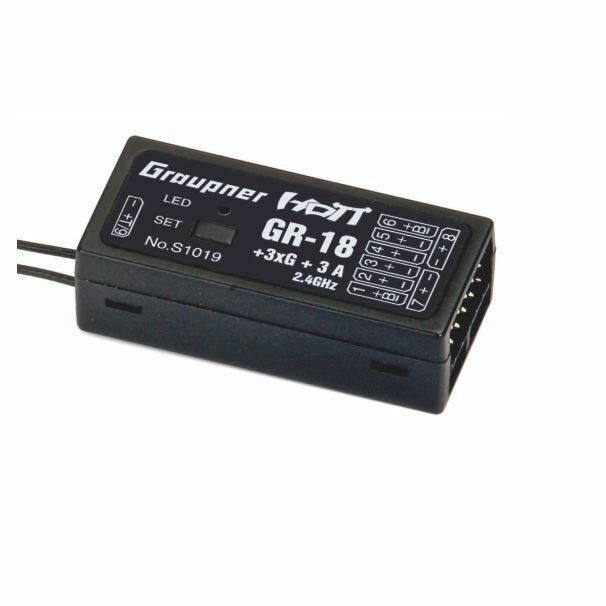 The GR-18AIR is a long-range receiver with diversity antennas using the Graupner HoTT protocol to provide real-time telemetry data of signal strength receiver voltage and temperature all to assist you during flight to enhance situational awareness and safety. Setting up an airplane or helicopter model or telemetry thresholds is done directly from your HoTT radio, wireless over the air. No computers or programming boxes necessary! Need to make a change to the PID or adjust the gyro? Simply land and make on-the-spot changes at the field or you can assign a control to do so even in the air during flight!